Is Toronto's interminable wait for panda access about to get a little longer? 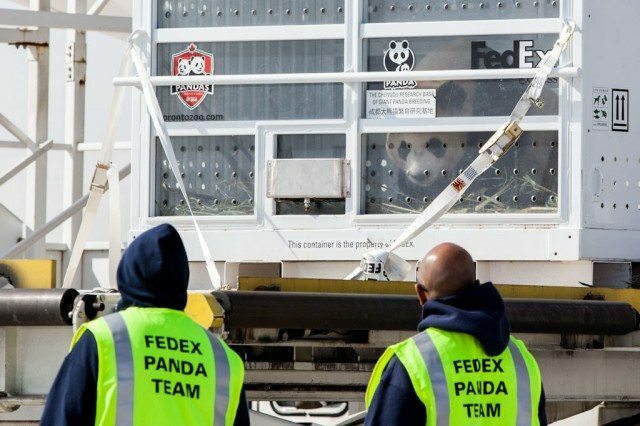 One of the Toronto Zoo’s two pandas arrive at Pearson on March 25. Life is so cruel. This city waited years for giant pandas, and now there’s a nontrivial possibility that the public won’t be able to meet the Toronto Zoo’s newly arrived pair of them face to (adorable, furry) face for a while. That’s because they’re being used as bargaining chips in a dispute between the zoo and its union. As the Star tells it, CUPE Local 1600, to which the zoo’s workers belong, is trying to negotiate a new contract with zoo management, and things aren’t going well. The City has applied to the Ministry of Labour for a “no board” report, which is an intermediary step toward a strike or a lockout. Things could get ugly as early as 12:01 a.m. on April 26. That’s reportedly when both sides will find themselves in legal strike/lockout positions. If a work stoppage were to happen, the union says the zoo’s specially trained panda keepers would have to walk off the job. “I would be very concerned about [the pandas],” Local 1600 president Christine McKenzie told the Star. Presumably, zoo management would have to come up with some kind of alternative care. The two pandas, Da Mao and Er Shun, arrived from China at Pearson Airport on March 25, where they were greeted by Prime Minister Stephen Harper and other dignitaries. They’re scheduled to go on public display on May 18. But who knows?